The Ax60K is a smaller version of the popular Ax60 carbon dioxide monitor. It is simple to wall mount in the area where CO2 is stored or piped. The Ax60K is a carbon dioxide (CO2) monitor and alarm. 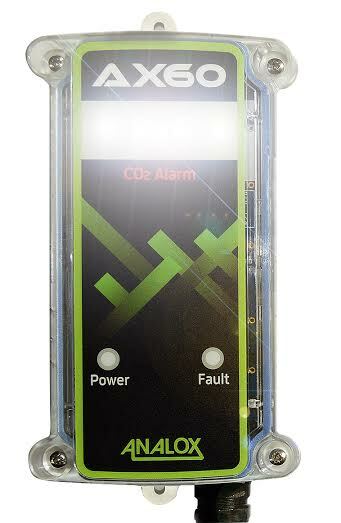 The alarm provides both audio and visual alerts in the case of increased levels of CO2. Standards such as EH40 and TUV in Europe mandate that employees and members of the public are not exposed to potentially dangerous levels of CO2 as it is a highly toxic gas in relatively small quantities. The Ax60K is an affordable, easy to operate CO2 monitor and is ideal for ensuring safety in areas where the gas is piped or stored. The Ax60K sensor needs to be installed at a height of 12-18 inches (305-457mm) above the floor - this is because CO2 is heavier than air and can collect at low levels. The alarm should be located above the sensor at about head height or at the entrance to the kiosk.